After a failed attempt trying to dine at That Place out in Maillardville, I did what I always do - never give up, never surrender (yes I love Galaxy Quest). So we made it out there on Pizza Thursdays where all of their small pizzas are only $7.99. 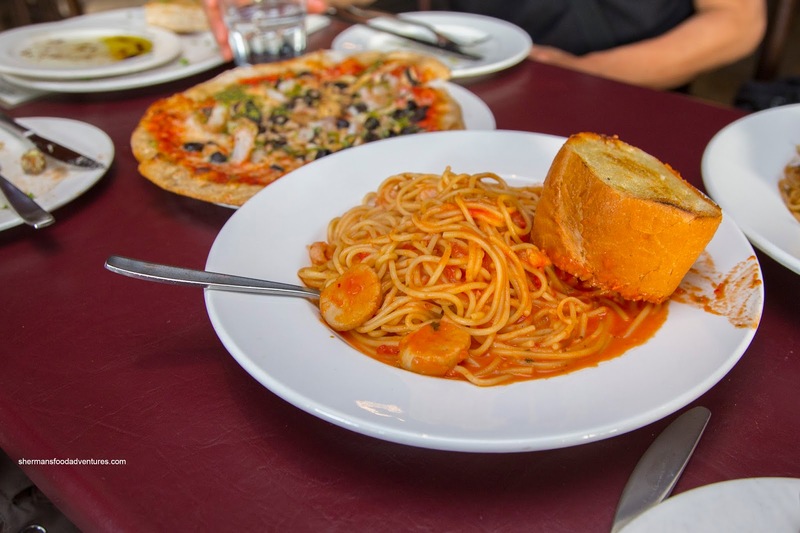 We knew this was going to be an enjoyable meal for the kiddies as they never say no to pizza and pasta (that meant we could eat in peace too without complaining about beef tongue and fish heads at the table). With the grandparents present, we were able to sample more than a couple of dishes too. 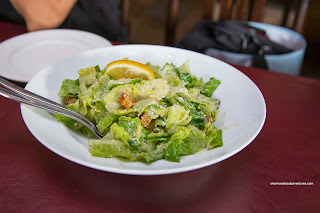 We started out with an order of their Focaccia Bread (served with EVOO and balsamic) and a large Caesar Salad. Made from the same dough as the whole wheat pizza crust, the focaccia was fairly soft and fluffy inside while sporting a slightly thin and chewy exterior. 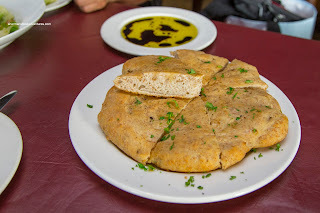 Loved that we were actually able to dip the bread into the vinegar (usually just get a bunch of EVOO and never get to the vinegar) as there was enough of it. As for the salad, the romaine hearts were fresh and crisp. Despite being aggressively dressed, the salad didn't feel heavy or taste salty. There was a nice balance of flavours including a good hit of Parm. 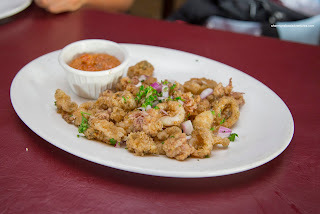 We also shared the Fried Calamari with roasted red pepper ricotta dip. If you can believe it or not, even since our visit to nearby Kefi, my son has decided to eat fried squid. Maybe he has hope yet as a foodie... But for now, we will take every little step as a success. The dish itself was a bit meager portion-wise, but it was well-prepared though. Each piece was tender with a slight chew left. The batter was crispy albeit a touch greasy. We loved the accompanying dip as it was thick, flavourful and didn't overwhelm the calamari. 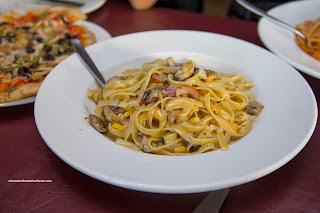 Moving onto the main dishes, we shared 3 pastas including the Fettuccine Fumato with smoked duck, sweet corn and wild mushrooms, in a creamy alfredo sauce with a drizzle of truffle oil. I liked how the pasta was al dente and just barely coated with sauce. As such, it didn't eat as heavy as it sounded. The flavours were quite subtle though which wasn't necessarily a bad thing as truffle oil can often be overwhelming. There was just enough woodsiness to go with the corn and the smokiness of the duck. However, the dish could've used more duck. Next, we had the Spaghetti Amalfi with shrimp and scallops in a rose sauce. We universally thought this was the best of the 3 due to the ample balanced sauce that was both a little bit tart while ending off with a smooth creaminess. The pasta remained toothsome despite the sauce. We found the scallops to be a bit overdone though. 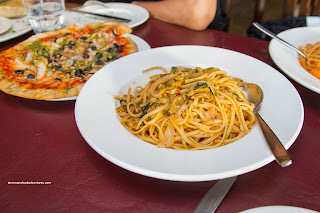 For myself I always tend to order the Linguine all Vongole whenever we go for pasta and this was no exception. Much like the first pasta, there was just enough tomato and wine sauce to coat each strand. Although there was ample baby clams strewn throughout the dish, I would've liked to see even more salty brininess (more clam juice?). Ultimately, that didn't make or break the dish as I enjoyed the light tomato sauce. 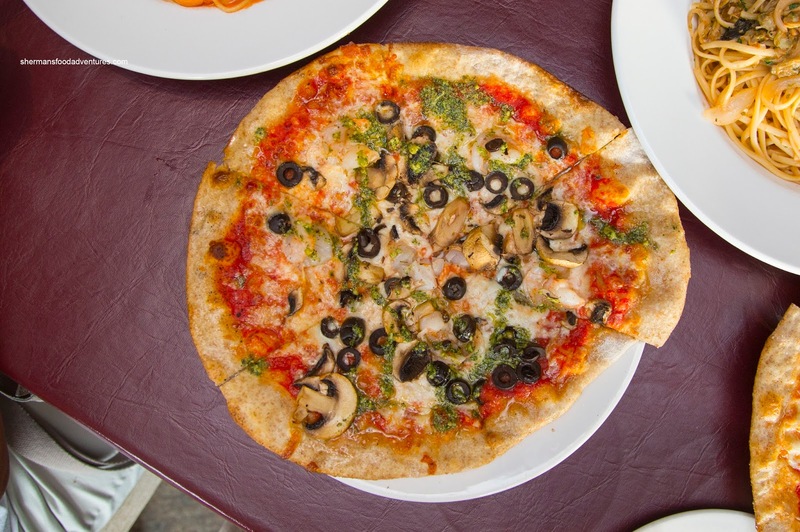 The first of our 2 pizzas was the That Pizza featuring a hand-stretched whole wheat crust topped with prawns, brie, mushrooms, olives and pesto. I liked how the crust was crunchy throughout while chewy inside. It held up well to the wet ingredients. With a wine finish, the salty olives did not overwhelm the other subtle ingredients including the buttery prawns and aromatic pesto. 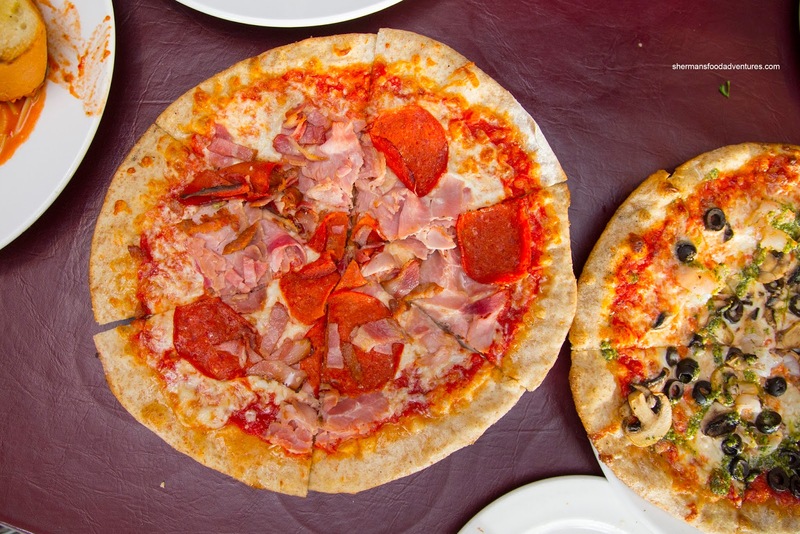 For the kiddies, we got them the Five-O with prosciutto cotto, pepperoni, Calabrese sausage and bacon. This thing was completely overloaded with toppings which meant it ate pretty hearty. Furthermore, there was an array of meaty flavours including salty, spicy, smoky and slightly tart. As you can imagine, we weren't able to finish the amount of food we ordered. 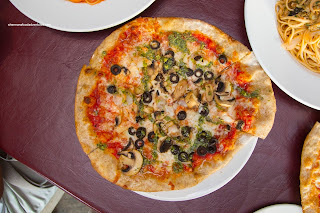 Since it was pizza Thursdays, our bill was quite reasonable. 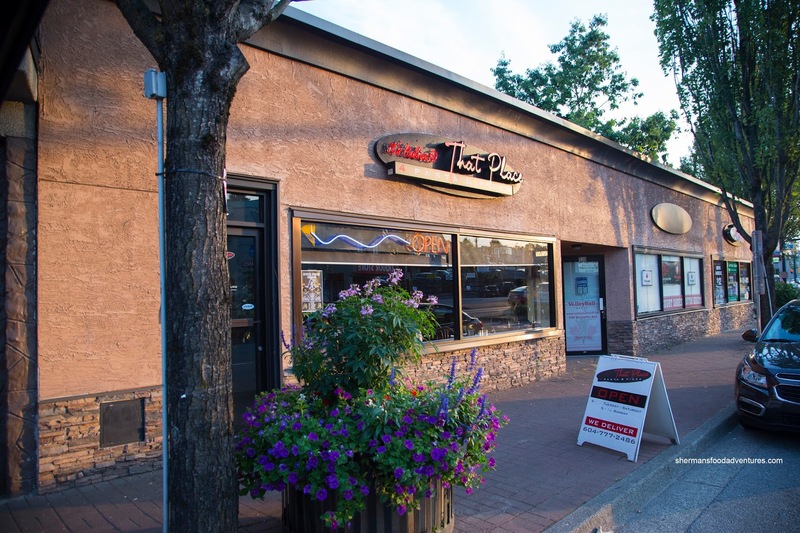 I think we might just return to That Place and take advantage of their Pasta Tuesdays as well.